I was in Dallas, returning from taking my daughter to work so I could use her car for the day. All I had to do to get back home was follow the GPS map installed on the dashboard of her Toyota Highlander. But I decided I wanted to get a different view of the map. Silly me. As I’m sure you have already guessed, I pressed the wrong button and lost everything on the screen — and couldn’t get it back. Because I had depended solely on the GPS to get me from one place to the next, I was confusingly lost with morning rush-hour traffic zooming all around me. I was fortunate that I eventually came to a landmark I recognized and, although it took an extra 40 minutes, I did eventually get back to my daughter’s house. I then used a map, and my own handcrafted cheat-sheet of right and left turns, to complete the day’s errands and to find my place back to pick up my daughter from work later that day. The truth is that I’ve had to be pulled, while screaming, into most technological changes. I was one of the last to finally get a cell phone, and it was only this past Christmas, and only because it was a gift from my son, that I got a “smart” phone. On the other hand, I was one of the first to get a home computer. After using one at work to write my newspaper stories, I found using a typewriter for my personal writings impossible. My first computer didn’t even have a hard drive. Everything ran from floppy disks. And the word-processing program on it came with a black screen and green type, or you could make the type orange. Today, I can’t imagine life without my computer and the Internet. Such a thought sounds barbaric. Ditto life without my Kindle, which was also a gift and which I’ve now had for a year. I thought I would miss the feel of a real book in my hand, but I haven’t. I think the fact I can be reading almost any book I want almost instantly is a miracle – well until I discover how much I’ve spent at Amazon each month. I still haven’t got a GPS, however. My canine traveling companion, Maggie, and I still use maps, albeit it computer ones, to find our way across the country. It seems a GPS might be as difficult for me to use as an electric can opener, which is why I still use a manual one. Her comment made this wandering/wondering old broad feel young – well at least until a pain in one of my joints announced a change in the weather. Bean’s Pat: Vimeo: My Friend Maia by Julie Warr http://vimeo.com/31733784 A video to inspire all us old broads, and perhaps those still young among us, too. I’m not a quitter. That’s mostly a good thing. But sometimes you have to admit you can’t reach the top of a mountain, fix a bad marriage or write a perfect piece of prose. So you come back down the mountain before you die; you move on with your life while you still have a bit of sanity left; and you send your imperfect article off to a publisher and begin a new piece of writing. I watched an anhinga, while hiking the Anhinga Trail in Everglades National Park with my granddaughter, Keri, that might have taken this advice to heart. When we came upon the bird it was perched on a limb above a shallow pool of water trying to swallow a fish too large for its thin neck. We stood there and watched it for a full 30 minutes as it attempted this task. Several times the fish fell back into the water. 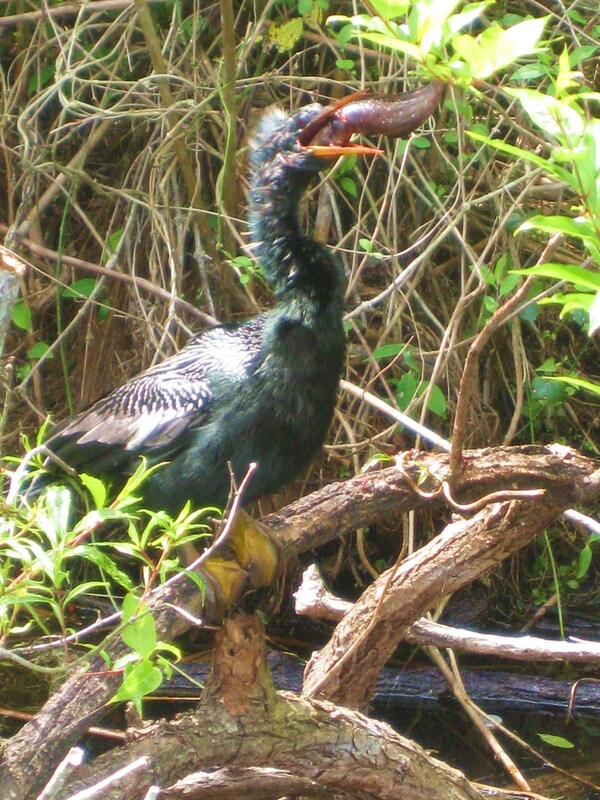 The anhinga would dive after it, spear it with beak, come back up to its perch and once again maneuver the fish head down into the opening of its throat. 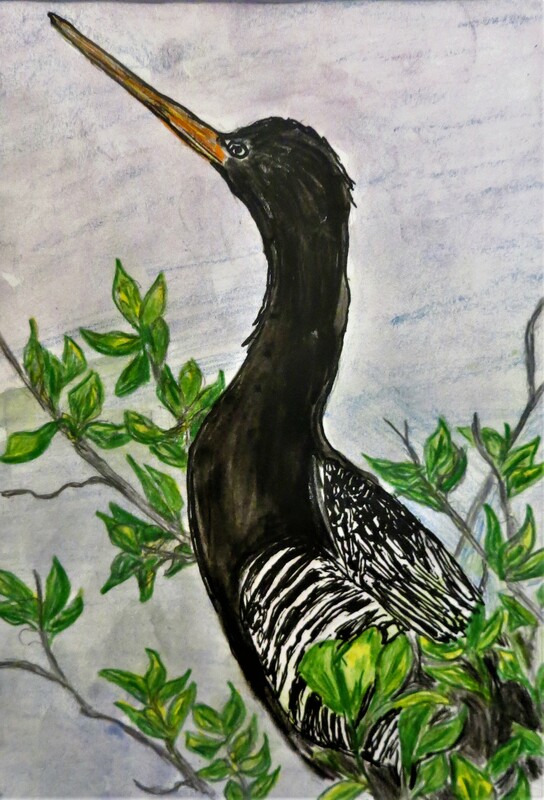 When Keri and I finally gave up watching and moved on, the anhinga was still at what just might have been one of those impossible tasks. 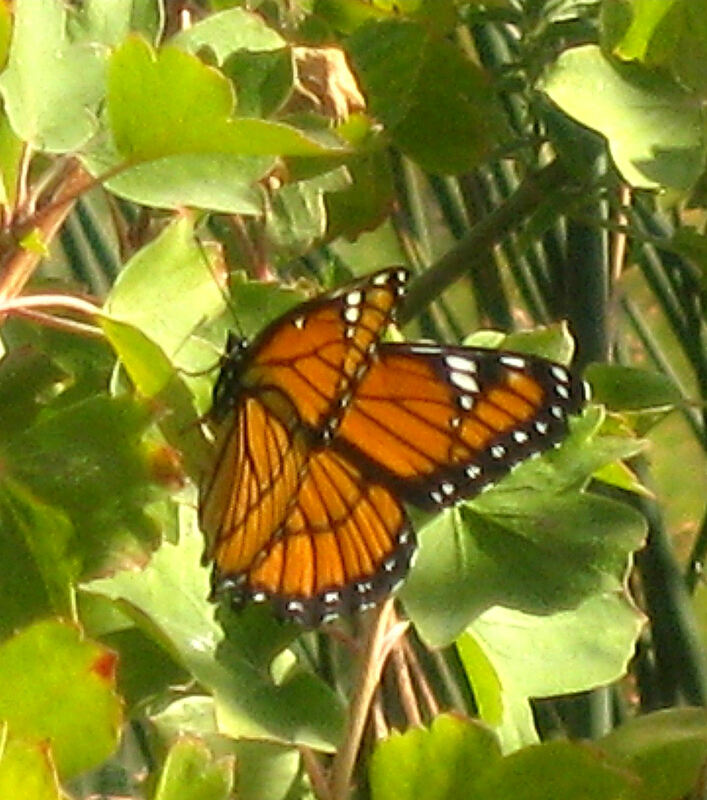 There’s much to see along this popular trail that winds for nearly a mile through a sawgrass marsh full of wildlife. 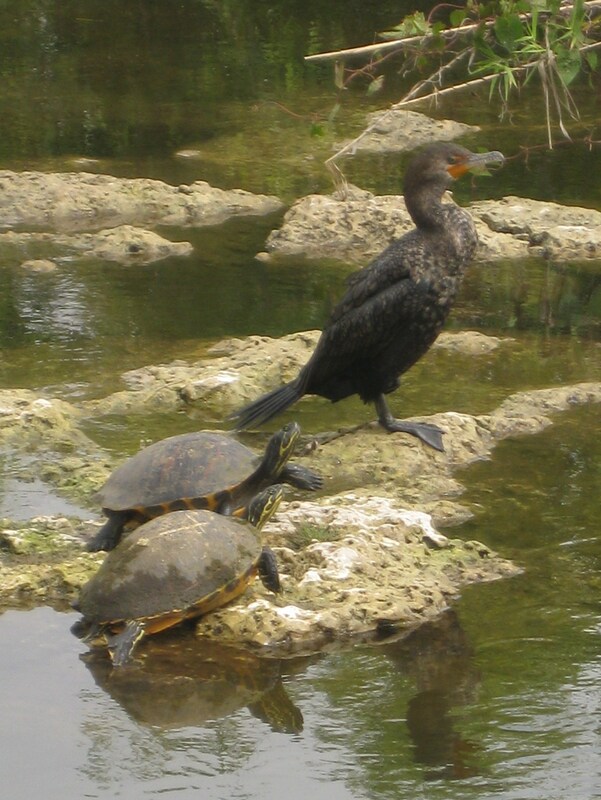 From the trail’s elevated boardwalk, one can almost reach out and touch cormorants, great blue herons, turtles and even alligators that call the area home. 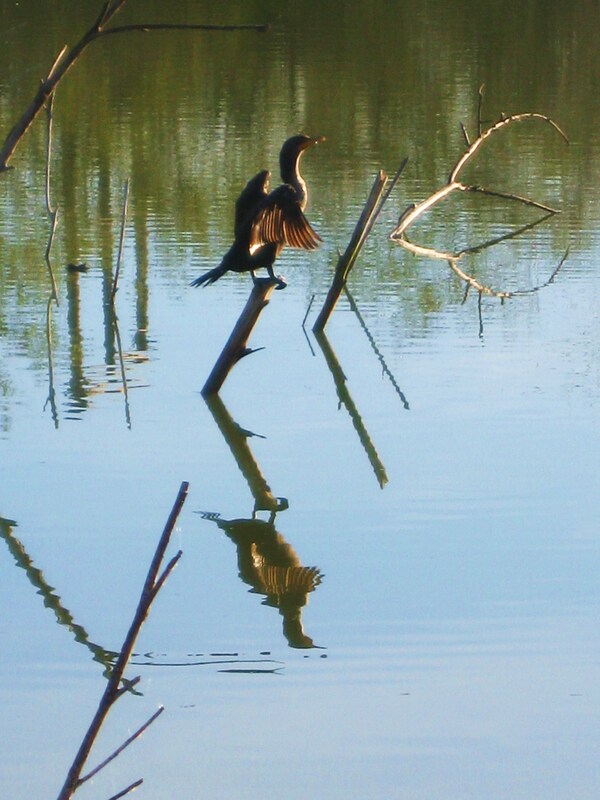 The anhingas, which give the trail its name, are particularly populous. It is sometimes called the snake bird because its low profile in water often leaves only its long-necked head visible.